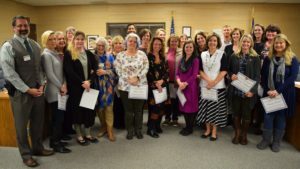 $30,000 distributed to projects led by educators of Watauga County Schools! Angela Alexander and Torry Ward of Watauga High School for their project titled “Cosmetology Updos and Outdos.” This project will provide Cosmetology students with mannequins that have human hair, facilitating more realistic practice in the skill of styling for students’ future career and recreational goals. Shelly Klutz of Watauga County Schools for the project “Defibrillator Feedback Training Devices.” The grant will provide WCS will purchase adult and infant CPR Manikins for Adult CPR training courses. Jana Smith from Watauga High School for “Just in Case,” which will provide three medical bags to be used by the school’s trained and certified individuals on the Quick Response Team. Melody Roaden from Bethel Elementary for the project Embracing “Earth Science in the Library,” which will increase the quantity and quality of their media center’s nonfiction literature to support 21st-century skills and the North Carolina Essential Standards in Science. Candice Trexler of Watauga County Schools’ project “Battle of the Books,” which will span all grade levels. Erin Ellington of Parkway Elementary for “Uke Can Do It! (Ukes and Tuners)” to facilitate students’ increased interest in learning to play the ukulele. Amber Dollyhigh of Blowing Rock Elementary for “Boardmaker and Sensory Need,” which will support children who are in need of visual schedules and multi-sensory moving parts in their curriculum. Stephanie Kostis from Cove Creek Elementary for the project “Math Enrichment.” This grant will fund math activities in Pre-K-8 classrooms at Cove Creek’s fall festival community event. Brandon Winbush from Watauga High School for “WHS Honors Choir Formal Wear.” This grant will update the choir’s almost decade-old gowns. The new gowns will be more durable, contributing to longevity. Ashley Tate of Mabel Elementary for “Creating with Clay.” This grant will enable Tate to implement one clay project per grade level, which will contribute to sensory learning, innovation, and the practice of North Carolina Essential Standards for Visual Arts. Chelsie Eldreth of Bethel and Valle Crucis Elementary Schools for the project “Learning with Snap Circuits!” This project will provide students with kits to create more complex circuits that can be used year after year in the school. Denise Presnell from Watauga County Schools for “Calm Corners for Classrooms,” which will provide resources for Calm Corners that have been proven by research to reduce students’ anxiety, stress, and focus. (Screenprinter).” This grant will purchase a 4 station, 6 color manual garment printer that will simulate more of a real world working environment for students. Jobeth Gobble of Hardin Park Elementary for “Carting STEM into the Extended Learning Center and the Holiday Snow Program,” which will build students’ interest in the subjects of Science, Engineering, Technology, and Math through project-based activities. Lindsey Postlethwaite of Valle Crucis and Bethel Elementary Schools for the project “The Ancient Art of Papermaking.” This project will bring a variety of materials to facilitate students’ understanding of the history and art form of paper. Sherri Hale of Valle Crucis Elementary for “3D Printer for Expanded Creativity,” which will provide a 3D printer for 5th-8th grade students to help build the school’s expanding STEM program. Callie Jarman of Bethel Elementary for “Science Resources.” The funding from this grant will help purchase the necessary science tools, materials, and resources for the pre-planned experiments in the WCS Harcourt Science textbooks. Ashley Greene and Susan Suddreth of Parkway Elementary for their project “Keep Calm and Learn On,” which will provide the materials for students to make a “calming bottle” that will help regulate emotions and regulate control in the classroom. Seth Freeman, Mark Shepherd, Jason Phelps, and Dustin Kerley of Watauga County Schools for the project “Instruction Construction.” Funds will go towards purchasing concrete blocks and concrete that will be needed to build a new backstop at the Watauga High School baseball field. Amanda Young Ward of Mabel Elementary for “Legos in the Library.” Ward will repurpose an unused bookshelf into a Lego World with vertical and horizontal building surfaces, books, and materials. Connie Peeler and Erin Scott of Bethel Elementary for their project “Body & Brain Adventure Room.” This grant will go towards the purchase of gymnastics materials for student movement, which will prepare them for optimal learning in the classroom. Candace Trexler and Amy Hiatt of Hardin Park Elementary for their project “Schoolwide Read.” Celebrating the picture book All Are Welcome, this project will go towards purchasing necessary materials to advertise and implement the school-wide curriculum. Chris Watson, Erin Ellington, Jeanie Hawkins, and Becky Reis of Watauga County Schools for the project “The Gift of Song!” This project goes to the direct goal of putting music literature in students’ hands, inspiring current and future students. Grady McKinney and Donna Raichle of Parkway Elementary for “Paramount Parkway,” which will expose students to 21st-century technology, local and global diversity, and dances from other cultures through use of a projector. The Classroom Grants program is our largest program. Teachers submit applications for funds in September for projects that will directly benefit students through innovative and creative teaching methods. Granted funds are awarded in early October. This is such an exciting time for WEF, knowing that the money given directly impacts students and typically provides benefits for many years.